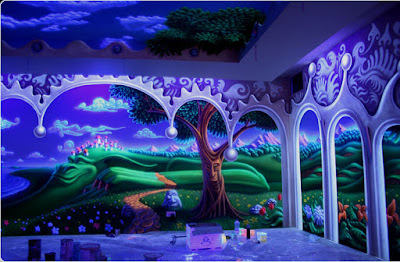 Wallpapers or wall murals and glow in the dark paint drawings which are painted with phosphor paint. Such a paint accumulates light energy during the day, and at night it returns a diffused and dim light. Typically, the main range of such colors - green, blue, warm yellow-orange. Manufacturers assure that such glow in the dark paints is absolutely harmless for people's health. 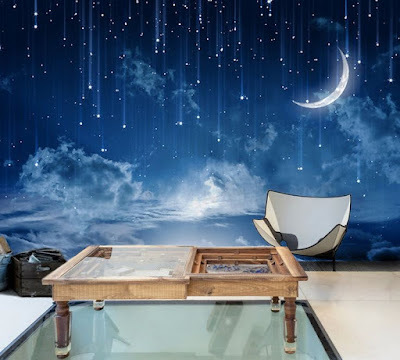 The glowing wall mural wallpaper with phosphor patterns can be very beautiful, look unusual and original, in addition, provide a pretty pleasant night and evening lighting, which, perhaps, is difficult to read on it, but nice to have dinner or socialize with the family. Possessing some skills, stencils and a set of phosphor paints, you can create such wallpaper yourself, using as background ordinary wallpaper or non-woven coating for painting. 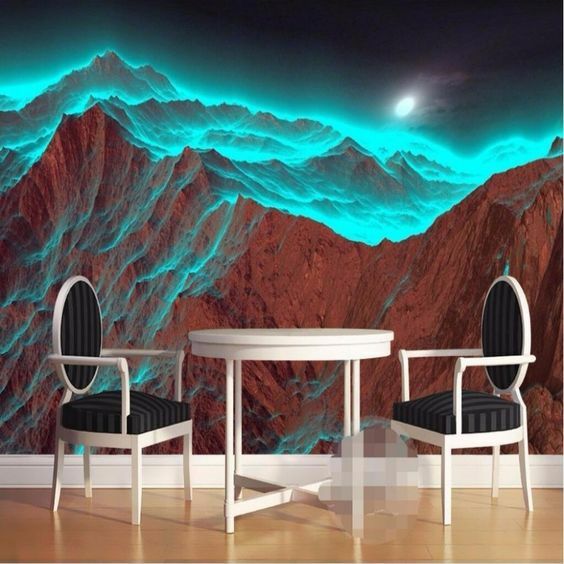 Glow in the dark mural Wallpapers, which represent a whole complex of modern technologies, allow you to create in the room a truly fabulous, amazing world. Figures are marked on them with a combination of a phosphor and fluorescent inks. The exact technology is still a commercial secret. 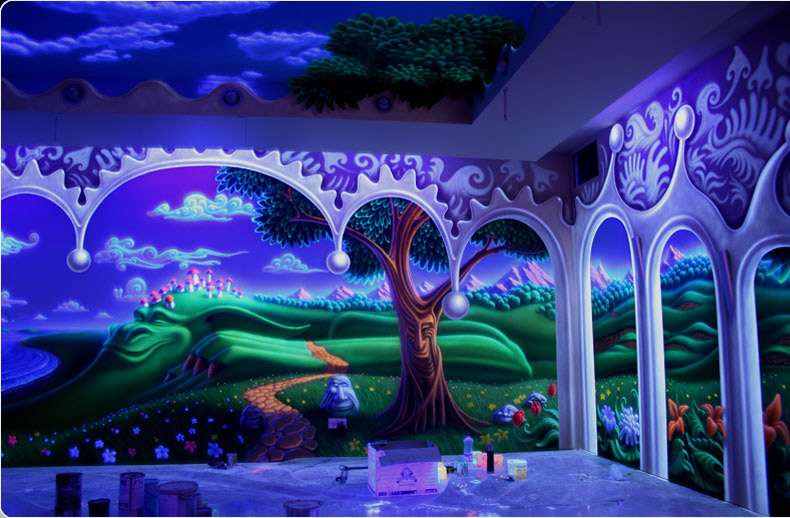 We only know that for such wallpapers a special kind of polymers is used, a layer of fluorescent paint is applied to it, which is manifested only under the influence of special lighting. Then a powder of phosphor paints is sprayed onto this figure. As a result of manipulation, a real work of contemporary design art is obtained. In the daylight, such wallpapers please the owners with their unusual three-dimensional drawings. With the onset of darkness, the wallpaper begins to glow. The full effect is achieved by using so-called black light lamps. The peculiarity of such illumination is that it practically does not emit visible light. A black light bulb or a Wood lamp radiates in the long-wave part of the light range. Its ultraviolet light waves are not fixed by our eye but are perfectly reflected by fluorescent paints that begin to glow. The spectacle is impressive, and, frankly, fascinating. Materials designed for interior decoration, always have some features of use and application. 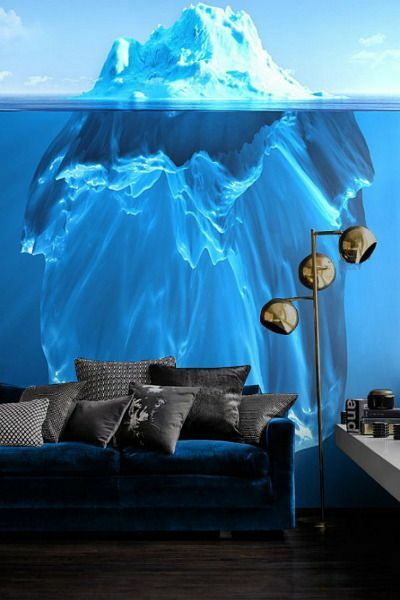 Glowing wallpaper for home walls is no exception. glow in the dark wallpaper, sometimes framing it with a frame baguette or highlighting in a different way. The cost of this kind of material is about 130 USD per roll. 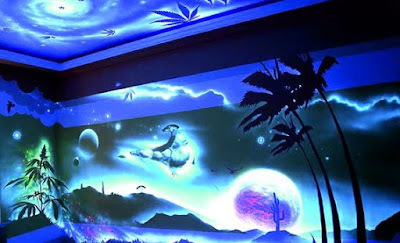 The second variant of wallpaper is Glow in the dark wall murals. They are available in the form of paintings that are added to the finished decor or have a beautiful abstract drawing. It is on such canvases that the technique of combining fluorescent and phosphor paint, as discussed above, is applied. 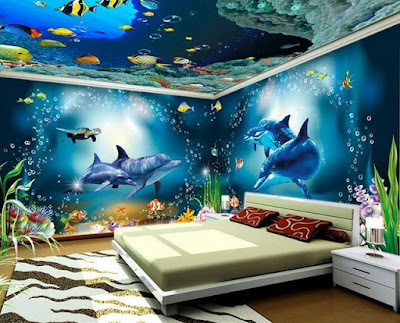 Such variants of wallpaper are suitable for decorating walls, and for gluing the ceiling, they accumulate light well and in the dark, they shine quite brightly. 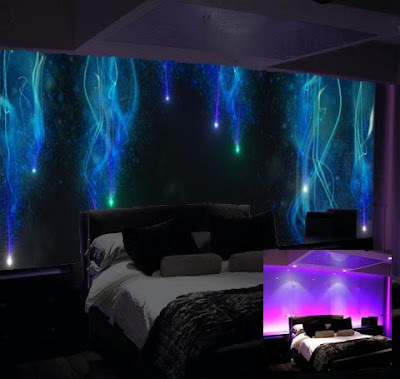 you can use these glowing wallpaper for home walls as an additional source of evening lighting, thus saving electricity. In the daytime, such wallpapers also impress with their voluminous, realistic drawings, plunging us into the depths of the ocean or allowing us to admire the vast cosmic space. Panoramic glowing wallpaper designs look very good in large rooms. Free space is necessary to appreciate the depth and beauty of the wall mural. 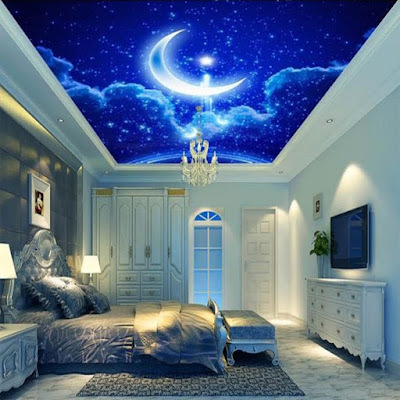 However, if you have a small room, and you want to use the glow in the dark stickers in your design, you are advised to paste the ceiling or a part of it with glowing wallpaper for the ceiling. this makes the room look particularly beautiful, the sky with flying birds, airplanes or fantasy images is quite logical. The dimensions of the panoramic light wallpaper can be different. You can find a ceiling mural with a size of 1.3 by 1.8, or a huge panel measuring 3x5 meters. In online stores, it's possible to choose a size of 1.3 to 1.5, which will help create a picture on the wall, which will decorate the interior very much. Depending on the size of the glowing in the dark stickers, the cost also varies. If your dream is to buy fluorescent wallpaper, then for the full effect of the purchase, do not forget to buy a Wood lamp for wallpaper lighting. Their cost starts from 6 USD per piece. They are easily screwed into the nests of lamps. Lamps can be placed around the perimeter of the image or select a point mount. 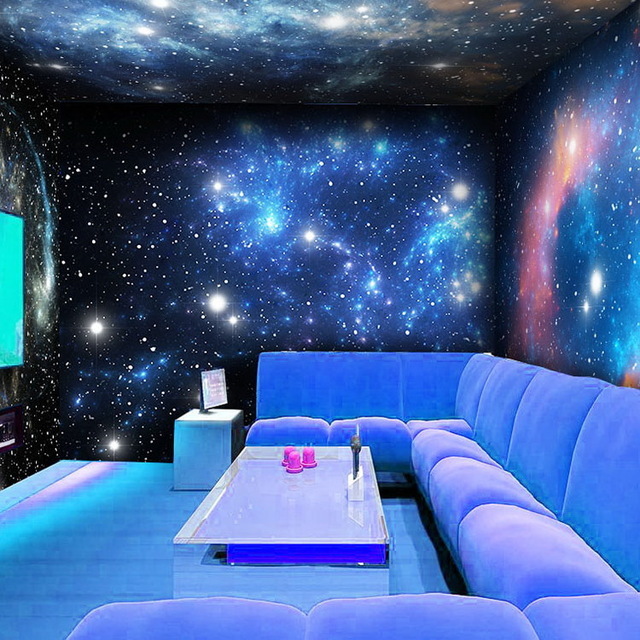 The main thing is that the light gets on the Glow in the dark paint, then the effect of such wallpaper will be complete. 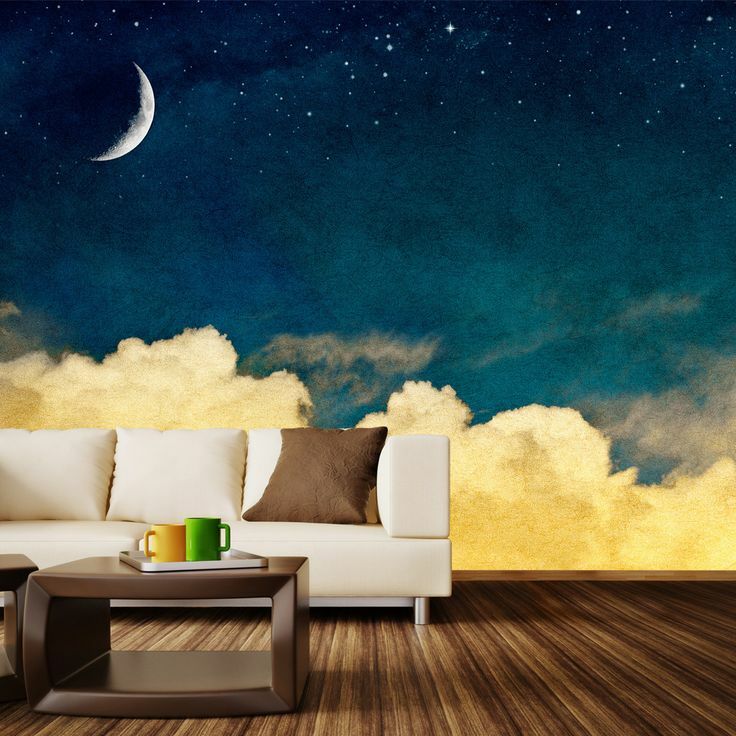 The wallpaper with small images glows dimly, but if you get a big panoramic picture, then its glow can prevent some sensitive people or children from falling asleep. Consider your individual perceptions when buying glowing in the darkness mural wallpapers. As for the purely practical aspects of wallpaper, they are very well exploited: they serve for a long time, they can be wiped with a damp cloth, they are resistant to ultraviolet and the light of bright lamps, do not lose color for a long time, they are not subject to deformation. They are quite strong and reliable, and their coverage is quite stable. Many consumers doubt the ecological purity of such wallpapers, but manufacturers assure that these products do not cause allergies, and are absolutely safe for people's health. Even children can not damage the natural composition of paints. 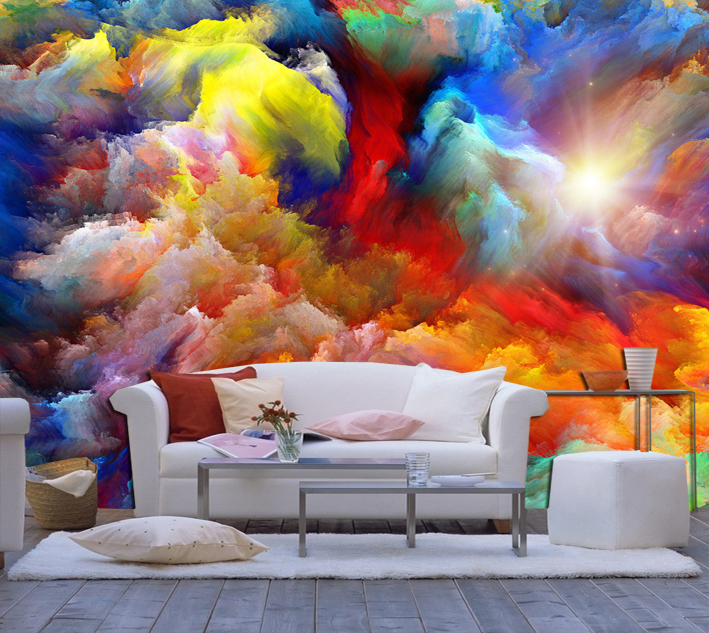 Deciding to purchase such wallpaper, keep in mind that you will have to contemplate them for a long time, so choose a drawing that you definitely will not bore from. According to psychologists, the least painful are landscapes, views of the sky, oceans, pictures of nature. Faster species of cities, buildings, and other creations of human hands are bored. The figures of people are even faster - actors and musicians, various girls and muscular macho. Often the buyers of glowing in the darkness stickers and wallpapers ask a question, how many will they glow? Usually, the radiation time is correlated with the light absorption time. That is, if they are "recharged" 10 hours, then they will shine about the same time. There is another kind of wallpaper emitting light. 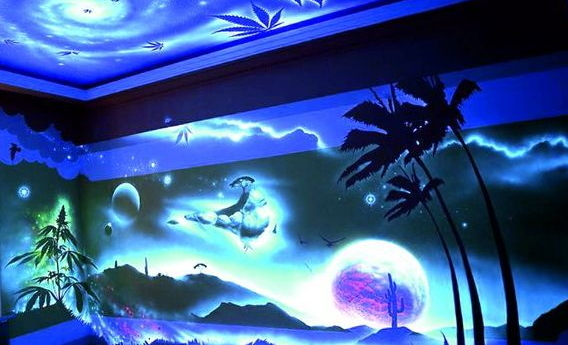 This is LED wall murals. They appeared only recently, and so far we have not been able to formulate a clear opinion on the practical application of this solution. Nevertheless, since we are talking about glow in the dark wallpaper, then their LED wallpaper designs are also worthy of attention. The technology is based on LED chips integrated into the base material. These wallpapers have the form of rolls. 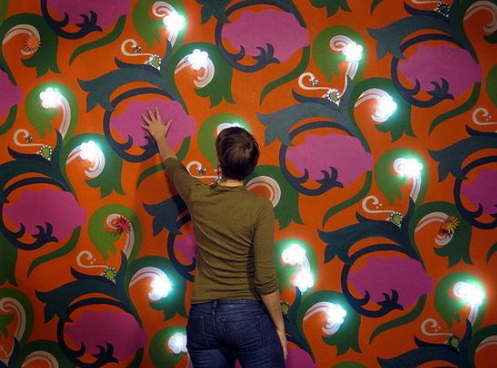 They are glued to the surface of the wall, and the glowing elements form an original pattern. LED wallpaper for home walls can be placed in a separate piece, or cover a section of the wall. They will help zonate the room or create the right interior accent. 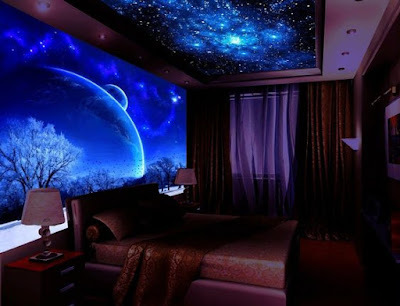 LED wallpaper designs provide not only the original design of the room, but also the possibility of economical lighting. LED elements are known for their low power consumption with a high degree of brightness. These original wallpapers, perhaps, are best for the club, but they can decorate a youth studio or a lounge in the Art Nouveau style. They will be relevant in the thematic bar or restaurant. 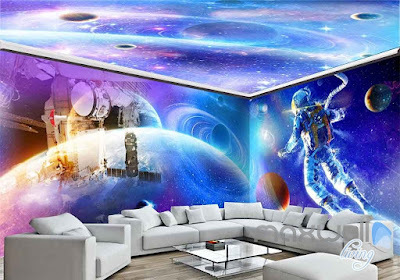 But, as you know, the interior fantasy knows no boundaries, and now the LED wallpaper is used as a kitchen backsplash wall covering or as a design for the office of a prominent scientist. And, you know, it looks great! Glow in the dark stickers, wall murals and wallpapers are sure to please those who love everything unusual, as well as dreamy and not devoid of romance. Such an object of the interior will be interesting for fans to creatively rethink the living space, as well as practical and economical people who want to save on evening lighting.